Lotus Herbals Whiteglow Oatmeal & Yogurt Skin Whitening Scrub exfoliates the skin gently, removes dirt, impurities, whiteheads and blackheads leaving your skin brighter and healthier with a shining glow. The gentle exfoliating action works on skin discoloration, dull and uneven skin tones and softens the skin giving you a firmer skin texture. Oatmeal exfoliates gently, restores the natural moisture balance of skin and yogurt moisturizes and lightens the skin reducing imperfections giving you silky, smooth and brighter skin. Exfoliates skin gently and works actively on skin discoloration. Removes dirt, impurities, blackheads and whiteheads. Adds life to dull and uneven skin tones. Restores the natural moisture balance of skin and and lightens it. Reduces skin imperfections and gives you silky, smooth and brighter skin. Explore the entire range of Scrubs & Exfoliators available on Nykaa. 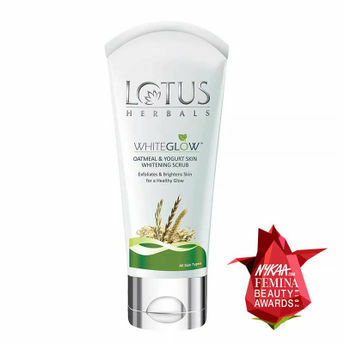 Shop more Lotus Herbals products here.You can browse through the complete world of Lotus Herbals Scrubs & Exfoliators .